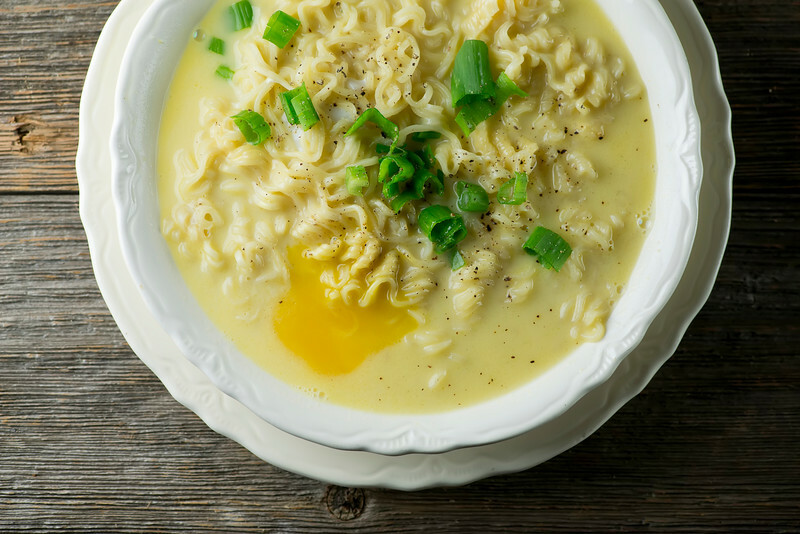 It’s amazing what some cheese and a poached egg can do for a humble package of ramen. Cheesy ramen with poached egg – comfort food to the max! We all secretly love ramen. Some of us (raises hand!) love it not so secretly, partly because it brings back warm and fuzzy memories of subsisting on it during those heady post-college days when we were young and crazy and ramen was all we could afford, and partly because it tastes so dang good. SO dang good that it’s hard to believe that anything could make its naughty taste better. But you know what can? Melted cheese, a little butter and a poached egg. THAT’S what can. Now just for the record, I am all for making a healthy and nutritious supper for your ravenous family 99% of the time, and I have lots of recipes on this here blog that will help you do this. From grilled fish tacos to zucchini soup to shrimp with watercress and sugar snap peas, I have your healthy dinner intentions covered. 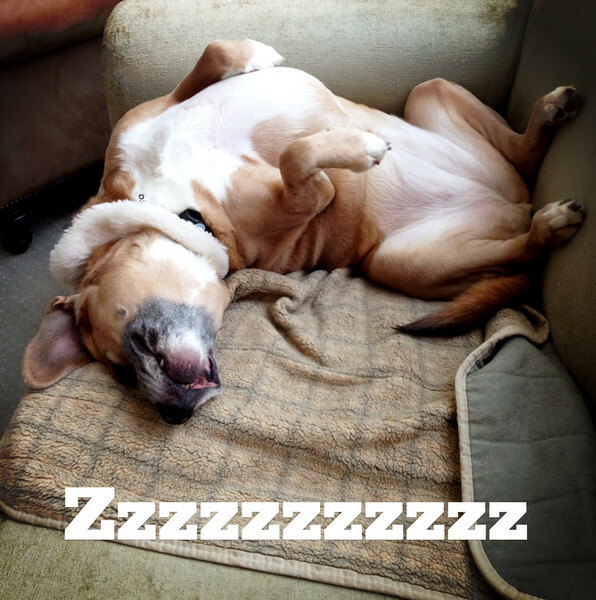 But some days, you just simply come home feeling like this. Like you just…plain…can’t. Can’t do it. This, my friends, is why this was invented. That and to help recent college graduates survive. And while you can definitely just cook it up in three minutes as is, if you are okay with taking five minutes, here’s what you can have: tender ramen noodles in a buttery, silky, cheesy broth with a perfect poached egg floating in the broth and some chopped scallions on the top for a little zing. The noodles cook up just as they usually do (and yes, with that extremely naughty flavor packet stirred in)…but then you add some butter and a few pieces of torn up American cheese and stir it around. And then you crack in an egg, drape the noodles over the top of it, and let it poach itself in the broth. And then you sprinkle on the scallions and some pepper. And then you break the egg with your spoon so it melts into the broth. And then you eat it. And then you realize that cheesy ramen with a poached egg in it has given you the strength to actually make it through the rest of the evening, and life is wonderful again. 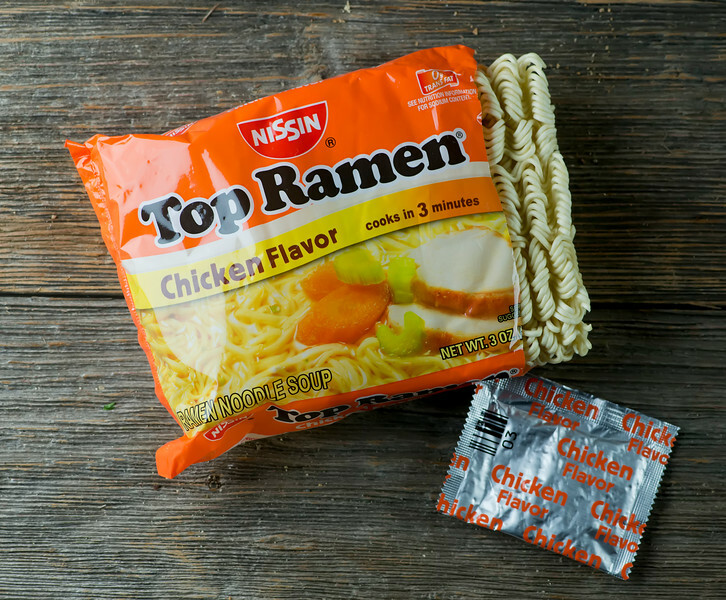 Cook ramen according to package directions, including adding the flavor packet. Add cheese and butter and stir until cheese has melted. Crack egg into a small bowl. Pull the noodles to the side, gently pour in the egg, and then ever-so-gently drape the noodles over the egg. Cover and let it sit for 3 minutes. Pour the whole thing into a large soup bowl. 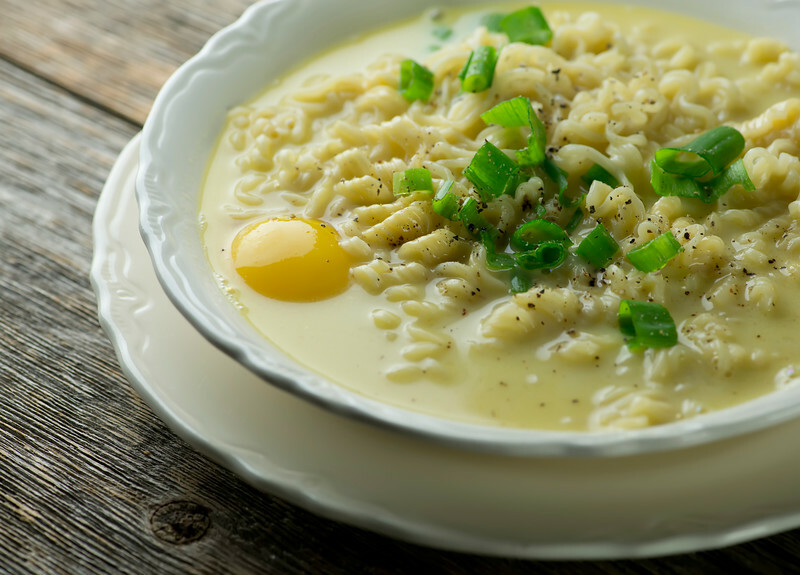 Sprinkle with scallions and fresh pepper, gently break the egg yolk so it melts into the broth, and eat it up. Feel much better. Hi Kate! Another hit out of the park! Thank you. So yummy! LOL!!!! & here I thought I was the only one that did the torn up cheese in the ramen thing!!! Hot dogs! I love it. never thought of dot dogs in the soup , a must try . I know – a great idea! It’s about the cheesy egg ramen. I did it and is the egg supposed to be cooked because I still have clear egg in the mix. Hi there! The egg should be cooked until the white is solid, so you just need to leave it in there for a little more time. Hope you like it!